I’ve complained a lot about British weather since moving to London but to be fair, the weather here is just rubbish. We didn’t see the sun for two weeks in July. It was in the mid-50′s for much of August and rained most days. Yuck. Right when I was about to give up on England all together, along came fall, with its crisp, cool weather and colorful leaves. Hello cozy sweaters! Hello favorite boots! Hello warm, snuggly blanket! Hello comfort food! 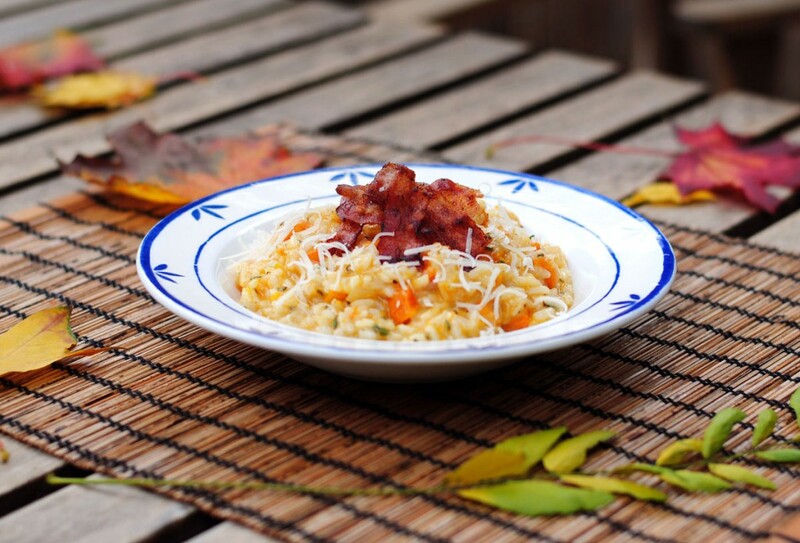 This risotto is fall comfort food at its finest. 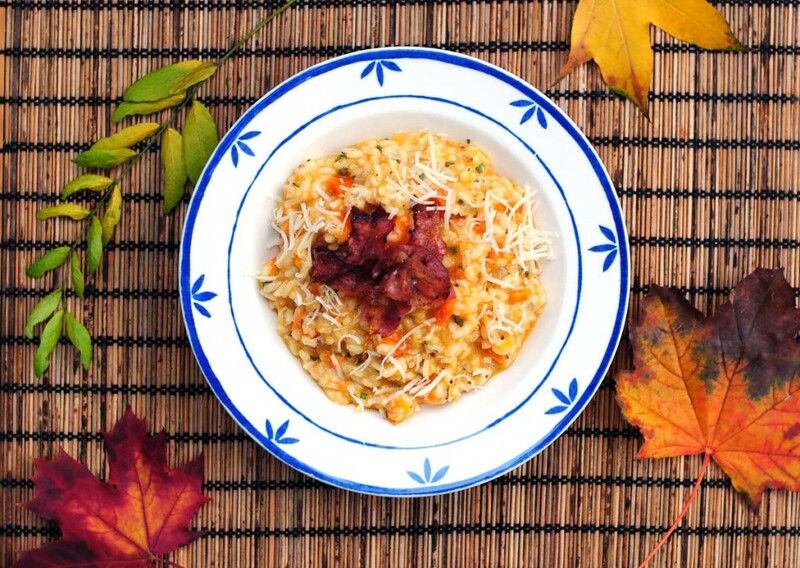 It’s warm, rich, creamy, and cheesy, and just perfect for a chilly fall afternoon. Roasting the butternut squash deepens its flavor and brings out its sweetness, which is balanced by the smooth and earthy sage. I love the addition of crispy, salty pancetta on top but vegetarians could swap it for some toasted pine nuts. 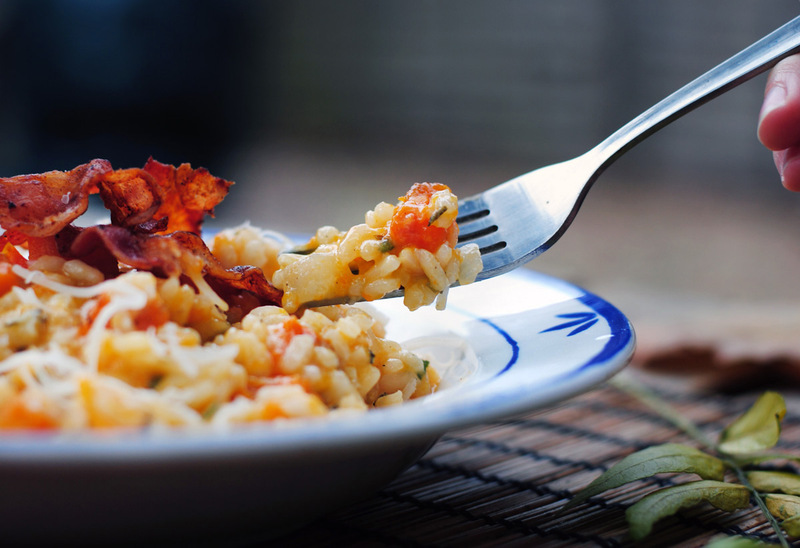 Risotto is simple to make but a bit time-consuming, so this is best for a lazy weekend afternoon. I made it on a Saturday afternoon, still in my pajamas and slippers, and enjoyed it on the sofa with a nice, warm blanket. If you’re feeling fancy, you could eat it at the table with a nice glass of wine. If you’re feeling really fancy, you could take a shower and get dressed before you eat. Or you know, not. Peel the squash, remove the seeds and chop into bite-sized cubes. Spread on a baking sheet, toss with some olive oil, salt, pepper and 1/3 of the sage and place on the center rack of the oven. Roast for about 20 minutes or until squash is tender. While the squash is roasting, fry the pancetta in a large skillet until crispy and set aside. Heat the olive oil and butter in a deep pan over medium heat. Sauté the onion until soft. Add the rice and cook, stirring often, until rice is slightly translucent. Add the wine and cook until it evaporates. Add 1 cup of the stock, half the butternut squash and half of the remaining sage, and cook until the liquid is nearly gone. Slowly add the remaining stock about 1/2-cup at a time and cook, stirring consistently, adding more stock as necessary. Wait for the liquid to be almost completely absorbed before adding more. You might not need to use all of the stock. When the risotto is finished (it should be slightly al dente) add the remaining butternut squash, the rest of the sage and the parmesan cheese and stir to combine. Remove from heat, cover and let sit for 2-3 minutes. Serve, topped with pancetta and some more parmesan cheese. Made this last night (sub prosciutto instead of pancetta) was Amazingly Delicious! We are going to make this again asap! Question though what type of white wine did you use! ?